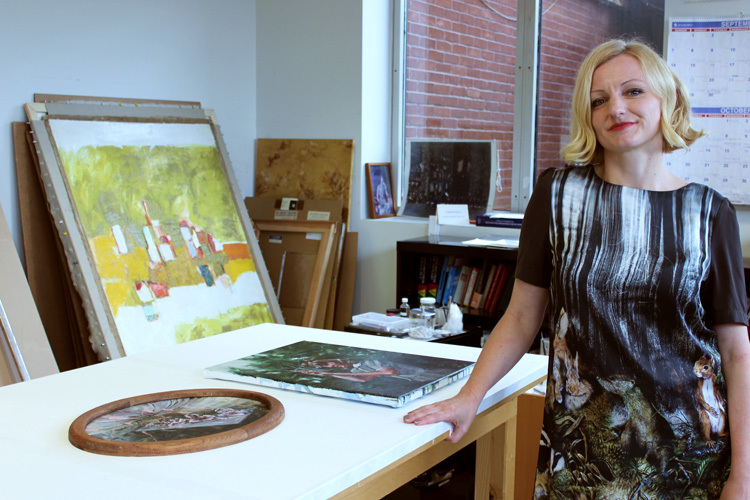 Artist Justine Otto with her work recently acquired by The Phillips Collection. This month, The Phillips Collection awarded its second Emerging Artist Prize, again selected from works on display at the (e)merge art fair, which closed October 5. This year’s winner is the 40-year-old Polish-born German artist Justine Otto, whose works were on view at the Hamburg-based gallery polarraum. Phillips Director Dorothy Kosinski, Senior Curator of Modern and Contemporary Art Vesela Sretenovič, and myself selected two small paintings by the artist: O.T. (Strich) and Ophto. Justine Otto’s figurative paintings show some affinities with the so-called New Leipzig School of painting, although Otto studied at the Städelschule, the prestigious art academy in Frankfurt, and lives and works in Hamburg. Like the most prominent protagonist of the Leipzig school, Neo Rauch, Otto’s paintings, most of which are based on found photographs, owe some debt to both social realist painting and surrealism. However, Otto paints in a more expressionist style, with looser brushstrokes, and her paintings mostly depict women, children, and animals, creating narratives that are both puzzling and intriguing. The oval–shaped painting O.T. (Strich) (Untitled, Line) depicts a group of children working on a long table suggestive of a classroom. The subtitle may refer to series of lines that frequently appear in Ottos’s paintings, giving her work a touch of conceptualism. 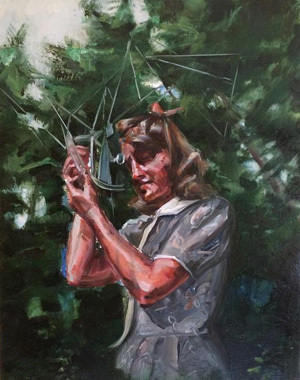 Ophto features a young woman holding up an ophthalmological instrument to her right eye while standing in a forest. Both paintings evoke the style of German photographs from the 1940s. Otto’s works are welcome additions to our growing holdings of contemporary German art, which include recent acquisitions by Wolfgang Laib, Walther Dahn, Franz Erhard Walther, Georg Baselitz, and Markus Lüpertz. As in the previous year, the Phillips Emerging Artist Prize was made possible by the generous support of Hank and Carol Brown Goldberg. 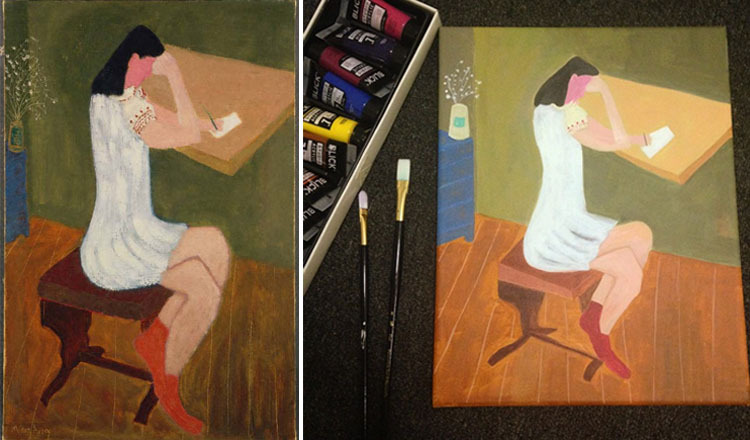 Instagrammer Seohee Yoon recently shared her version of Milton Avery’s Girl Writing (1941). We think her attention to detail yielded a pretty spot on result! If you’re an artist, what are some pieces that have inspired your own work, either directly or indirectly?